Old Orchard Beach is a beautiful destination on Maine's southern seacoast. It is home to a gorgeous seven-mile white sand beach, one of the best beaches in the entire state. All of the hotels on our list are located directly on or within walking distance of the shore and many of them have accommodations with breathtaking ocean views. But the beach isn't the only attraction in Old Orchard Beach. The area is also home to fun amusement and water parks, mini golf courses, historic lighthouses, and many other attractions. You can go horseback riding, kayaking, or charter a deep sea fishing excursion. Our list of Top 10 Old Orchard Beach Oceanfront Hotels will help you pinpoint the perfect place to stay while you explore this wonderful coastal destination! Maine's ruggedly beautiful coastline is the perfect place for a retreat, whoever you happen to bring with! There might be no more apt destination if you're interested in a beach-filled vacation, as Black Point Inn features beaches on three of its sides! Between the ever changing seascape and the Inn's majestic silhouette, it's easy to confuse Black Point with heaven. The character, history, and traditions of the historic property shine through in every aspect, from the two superb on-site restaurants to the geo-thermally heated pool (that we strongly suggest you spend as much time as possible in). However you spend your vacation at Black Point, you're going to leave with memories that last a lifetime! The hotel is 11 miles from Portland, a mile from Scarborough Beach State Park, and 13 minutes on foot from the Winslow Homer Studio, home of the famous painter. There's a refined restaurant with ocean views, a casual pub with a porch, and an outdoor pool. The Ocean Walk Hotel rests peacefully on the quiet northern end of Old Orchard Beach, making it ideal for anyone seeking a little tranquility! This hotel has a cozy, oceanfront beach cottage atmosphere. Their boardwalk takes you right out to the beach, where you can lounge all day under a large sun shade on your complimentary lounge chair. After a day at the beach, cook up a delicious meal on the BBQ grill or relax in the heated indoor pool. Every room at the Ocean Walk Hotel is non-smoking. They offer a variety of quality lodgings, including one-room studios and two-room suites. Each unit has a full kitchen with a full-size refrigerator, two burner stove top, microwave and coffeemaker. All utensils and cookware is provided! Other room amenities include cable TV and free Wi-Fi. Some accommodations have full ocean views! Discover the peaceful end of Old Orchard Beach at the Ocean Walk Hotel! Every guest accommodation has a full kitchen! The hotel has a guest laundry facility and complimentary detergent is provided. If you’re looking for an Old Orchard Beach destination that’s open year-round, the Sea Cliff House is a wonderful choice. This charming hotel rests on a quiet, tranquil section of the beautiful 7 mile long beach. Sea Cliff House comprises three different buildings, each offering different lodging options. There are 22 recently renovated Two-Room Kitchenette units, which offer a full bathroom, new kitchen area, and living room. The Ocean Front Building houses 9 spacious Ocean Front Rooms with sprawling views of the sea. If you want to be closest to the beach, the Jacuzzi Rooms are your best option. These units have private decks with great ocean views. Last, but not least, the hotel offers three luxurious suites. The Penthouse Suite is the newest and features two bedrooms, a kitchen, a gas fireplace and two private balconies. The other suites include the Saco Bay and Grand Suites. In every unit in every building you will find a refrigerator, microwave, and coffee maker. The Old Orchard Bay area is brimming with fun activities and places to see. There are numerous amusement parks, mini golf courses, and wildlife refuges. Not to mention the beautiful lighthouses, an absolute must-see when visiting the coastal Maine area. If you don’t feel like venturing too far from the resort, stay back and enjoy their sunny beachfront pool area with a hot tub, lounge chairs, umbrella tables and a BBQ grill. At the Sea Cliff House, the peaceful sounds of the surf will greet you each morning and ease you to sleep at night. Visit Ocean Park, a classic seaside vacation village with old world charm – just half a mile south of Sea Cliff House. Be sure to check out the hotel's great specials! At Alouette Beach Resort, you can choose from over 70 different accommodations and styles – all of which are only steps from the beach! There are multi-room cottages, Jacuzzi suites, beachfront and ocean view hotel rooms with balconies, kitchenette units, and economical ocean view rooms. With so many different lodging options available, you’re sure to find the one that best fits your specific needs and preferences. No matter which room you choose, you’re guaranteed exceptional service from the friendly staff at Alouette Beach Resort. After a good night’s sleep, head to the Alouette Beach Café for an omelet or a stack of delicious Belgian waffles. Once you’re fueled for the day, hit the beach, the golf course, or the amusement park. If you’re looking for adventure, charter a fishing excursion or go horseback riding. There’s plenty of shopping, entertainment, and fun in Old Orchard Beach – and Alouette Beach Resort is the perfect place to stay and enjoy it all! All accommodations at the resort include color cable TV, free HBO, pay-per-view movie selections, refrigerators, clock radios, and coffee makers with complimentary coffee. Check out the resort's great Group Specials! We’re kicking off our list with an outstanding family-friendly oceanfront hotel. Open April – October, Beau Rivage Motel offers comfortable and clean lodgings in a fun atmosphere. The motel is only 75 yards from the 7-mile beach and only a five-minute walk from The Pier and downtown. Talk about convenient! In the Old Orchard Beach you’ll find numerous things to do on and off the water like kayaking, horseback riding and antiquing. When you’re not spending all your time at the beach shore or exploring the area, Beau Rivage Motel has great amenities to take advantage of. There’s an outdoor heated pool, hot tub and a sauna. Cook up a delicious family meal at the “Out-Back” BBQ area, which has gas grills and picnic table or dine at one of the town’s excellent restaurants. Beau Rivage Motel has three buildings that house their guest rooms, which come in a variety of arrangements. There are standard Double Rooms, King Rooms, Deluxe Kitchenette Rooms and even Jacuzzi Suites. For even more space, Manager Rooms are available, which offers a separate sitting area and an eat-in kitchen. All units come with a microwave and fridge, cable TV, air conditioning and free Wi-Fi. You’re sure to find accommodations to fit your needs and budget at Beau Rivage Motel! Beau Rivage Motel is making efforts to help preserve their area's natural assets and has adopted a variety of Green practices. Make sure to visit the area's historic lighthouses! Taking the five spot on our list is a resort that has won the Governor’s Award for Tourism Excellence in 2012. The Moontide Motel, Cabins and Apartments has newly renovated accommodations that are exceptionally clean and comfortable. Choose an affordable one or two-bedroom motel unit. Some rooms have kitchenettes! The Moontide’s quaint cabins also have one or two rooms and come equipped with coffeemakers, refrigerators, microwaves and flat screen TVs. If you’d like even more space and privacy, stay in one of the hotel’s cozy Apartments, which feature screened in porches or private patios. And all apartments have a full kitchen and come with a gas grill. These units are some of the largest in Old Orchard Beach! When you stay at Moontide Motel, Cabins and Apartments, you’ll be less than one minute from 7 miles of wide, white sand beaches – the most beautiful in Maine. Plus you’ll be within walking distance of all of the best Old Orchard Beach activities and excitement in the Town Square. To sum it up nicely, the charming Moontide Motel, Cabins and Apartments is close to everything but far enough away to provide you with a quiet, peaceful seaside vacation! Moontide Motel, Cabins and Apartments has an in-ground heated pool! Old Orchard Beach has a professional fireworks display every Thursday evening from June 21 – Late August. Out next hotel is Waves Oceanfront Resort, where every room is only 150 yards from the beach! This property has a variety of accommodations, which include guest rooms and five cottages. The cottages are perfect for large families or groups and two of them are located directly on the beach. The guest rooms offer an array of sleeping arrangements, from two Queen beds to one King bed to Two-Bedroom Suites. Some accommodations offer ocean views and full kitchens. Most of the units have a private deck, cable TV and kitchenettes. The summer months are the busiest at Waves Oceanfront Resort. Bring your family and enjoy spending your days on the beach building sand castles, collected seashells, and relaxing in the warm sunshine. Grab breakfast and/or lunch at the resort’s Beach Street Café then stop next door at Waves’ two quaint shops. Though summer is the busiest season, the spring and fall months are also a beautiful time to visit coastal Maine. Waves Oceanfront Resort is open from May through October! At Waves you can witness spectacular sunrises in the morning, followed by romantic moonrises in the evening. 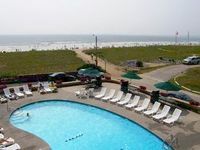 The Waves Oceanfront Resort was founded by the Weinstein family at the turn of the century and today is one of the largest hotels in Old Orchard Beach. This oceanfront inn is located on West Grand Avenue, just minutes from the Pier, where you can find great dining, shopping and entertainment for all ages. There are mini golf courses, amusement parks, arcades and waterparks nearby. If you want to get off the mainland, head out to sea on an exciting whale watching or deep sea fishing adventure! Whether you’re a couple looking for a romantic getaway, a family on a fun-filled vacation or a business traveler looking for a spacious beach front room, the Sea View Inn has accommodations to fit your needs. The Suite units have kitchenettes and the oceanfront and ocean side rooms are just steps from the beach! All accommodations come fitted with air conditioning, cable TV, and telephones. 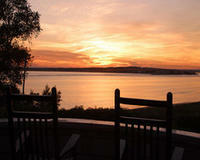 When you stay at Sea View Inn, everyday fun and relaxation come standard! Sea View Inn has a large heated pool and gas grills on their poolside patio! Check out the inn's great specials! Normandie Motor Inn is located directly on the beach, in the heart of the best shopping and restaurants! Most of the guest accommodations at the Normandie are located in their L-shaped building. Many of the rooms are ocean front or ocean view, just steps from the sand. In order to satisfy every type of guest, the inn offers a variety of accommodations. There are kitchenette units and even rooms with luxurious Jacuzzis. If you want something more spacious, apartments are also available. In every unit you’ll find a cable television, a microwave and fridge, and air conditioning. Guest are welcome to utilize the inn’s indoor heated pool and hot tub on those days when the rain hinders your beach plans. In Old Orchard Beach, ocean recreation is a must-do. Hit the water and go on a lobster boat tour, sea fishing, whale watching, or kayaking. This Maine destination is great for kids! There are amusement parks, go karts, and so much more within minutes of the inn. Make your reservations at the Normandie Motor Inn early because the rooms fill up fast! The Bouffard Family have been your hosts at the Normandie Motor Inn for 40 years! The inn offers discounts if you stay 7 nights or longer! We’re going to round out our list of Top Old Orchard Beach Oceanfront Hotels with a family owned and operated inn that’s located directly on the beautiful 7-mile beach. 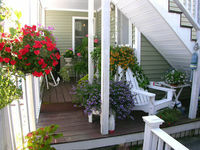 The Beach Walk Oceanfront Inn is a wonderful place to spend your vacation to Maine’s southern seacoast! Though the inn is on the smaller side, they have many amenities and features of a large resort facility. Plus, they offer a nice variety of clean and comfortable accommodations. Their hotel rooms come with or without convenient kitchen facilities. If you’d like to room in something a little more spacious, select a one or two-bedroom apartment/suite. All of the units at The Beach Walk Oceanfront Inn include high speed Internet, premium cable channels and membership privileges at a nearby fitness club. Old Orchard Beach is a great family destination. Some of the attractions include Beech Ridge Motor Speedway, Funtown/Splashtown U.S.A., Palace Playland, and York’s Wild Kingdom. If you’re on a romantic getaway with your loved one, a chartered sunset cruise is a great way to spend an evening. And great golf courses are nearby! 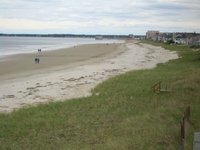 Whatever reasons bring you to the Maine seacoast, you’re sure to enjoy your vacation at The Beach Walk Oceanfront Inn! Make sure to call the hotel for details before you bring your pet!